With all of the distractions, obligations, and personal pursuits in life, it can seem difficult to prioritize your partner. In fact, some believe it is downright impossible. Huh? How can I possibly choose my partner first? What about my kids? What about my faith? What about my interests? What about ME? 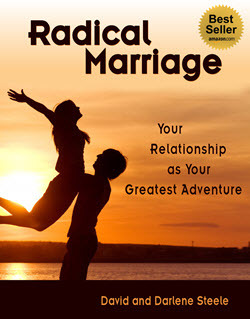 In Chapter Two of Radical Marriage we highlight the Five Promises of Radical Commitment. In our view, this forms the cornerstone of any couple seeking to go beyond happily ever after. While each of the promises must be taken together, here we focus on The Second Promise: I promise to choose you first. David loves boats, sailboats in particular. He loves the water. He is most happy being on, in, under, or near the water. It’s part of who he is. Darlene gets violently seasick. She is uneasy in the water. The thought of even stepping foot on a boat can elicit motion sickness. She naturally gravitates away from water. What to do? Choose Your Partner First. A Radical Marriage means you are committed to each other, not to your own self-interests. It means you put your partner first. Darlene, despite her feeling about the water, encouraged David to get a boat and made it her mission to conquer her fears. David, in turn, does everything in his power to make being on the boat comfortable for Darlene. There’s even talk about living on a houseboat someday, though David has made it clear that he chooses Darlene, with or without the boat. We all have concessions to make. We all make sacrifices. We all need to let go of some things that we might want in order to be with a particular person. We need to put partner before pursuits. And we can consciously be happy with that or we can unconsciously never let go of that. We can decide to be happy and stay in the moment, or we can tolerate our situation day to day, staying in touch with how we are being denied what we really want, always slightly aware of how our life is not the way we want it to be. On the other hand, you just might be surprised how happy you can be and where your relationship can go when you elevate your marriage above all else. Choosing your partner first doesn’t mean you are not prioritizing yourself, your family, or anyone or anything else. It’s NOT either/or, it’s both/and. This simply means you recognize that you, your family, and your kids will be much happier and better off if you and your partner are a solid, unbeatable team and have a strong couple partnership IF you both prioritize each other’s happiness and you each choose the other first. If, for example, you put your kids first, you have a kid-centered household and that tends to not work very well for anyone. The kids get spoiled and the partner gets resentful because they end up living parallel lives. Choosing your partner first, always, above everything, is a form of radical commitment, which benefits all who are under its influence. Still, this concept can be especially tough for women, who may feel they are choosing the man over the child. This is not the case. It’s a matter of prioritizing the relationship and the partner. Do you want your partner to choose YOU first? Most would say “YES!” True partners must be a team, which ultimately results in more empowered children. Radical Marriage starts with making your partner the most important person in your life and not taking him or her for granted. You don’t put anything else above your partner—not work, not home, not family, friends, kids, hobbies, boats—nothing. You choose your partner first, always.